This article is about Sangheili members of the Covenant Honor Guard. For other uses, see Honor Guard. "We have always been your protectors!" 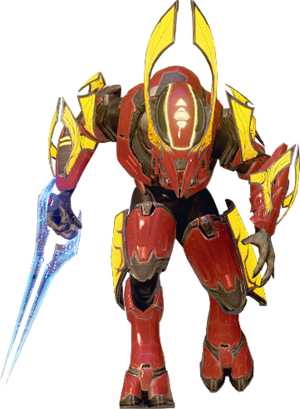 Honor Guardsman is a Covenant Sangheili position formerly in the Covenant Honor Guard and later in select splinter factions of the hegemony. Within the Covenant, the Honor Guardsmen served as elite protectors to the Prophets, particularly the Hierarchs. "The Sangheili honor guard was always vigilant and almost inert when at peace. One never had to worry about what a Sangheili might do any more than one worried if the stars would come out at night." Honor Guardsmen were among the most skilled of all Sangheili warriors and were hand-picked for the duty of protecting the High Prophets and other high-ranking officials in the Covenant High Council. The Lights of Sanghelios were a revered elite unit among the Sangheili Honor Guard. Honor Guardsmen in service to the Honor Guard of the Covenant wore highly ornate armor, colored in a combination of glowing red and orange. It featured jutting spikes and pauldrons, though they sometimes wore non-ceremonial armor for the sake of practicality. It is unknown how many Sangheili Honor Guardsmen were in service, though the Sanctum of the Hierarchs on High Charity could accommodate as many as three hundred. Honor Guardsmen were expected to immediately kill anyone who drew a weapon in the presence of a Hierarch, though they might stand down should an Arbiter do so. In addition, they kept order during important meetings within the High Council. Although the position was a great honor, it was seen by some Sangheili as a merely ceremonial duty and a way to silence those who were aware of the Hierarchs' duplicity. [verification needed] Because one was expected to encounter little to no combat in the posting, select Sangheili were known to have even declined a place in the Honor Guard. The Sangheili Honor Guardsmen were likely instated soon after the signing of the Writ of Union, which led to the establishment of the Covenant. For thousands of years, the Sangheili protected the Hierarchs and the other Prophets according to the Writ's strictures. After the death of the Prophet of Regret during the Ninth Age of Reclamation in November 2552, the Prophets of Truth and Mercy replaced the Sangheili Honor Guard with the Jiralhanae. This "Changing of the Guard" was a major step in a carefully planned coup that soon devolved into the Great Schism. Some of the Honor Guardsmen killed themselves after learning of the Prophets' treachery. Others assisted Arbiter Thel 'Vadamee in stopping Tartarus, the Chieftain of the Jiralhanae, from activating Halo Installation 05 and therefore killing all sentient life in the galaxy. Following the defeat of the Covenant, many of the former Sangheili Honor Guardsmen found themselves isolated and purposeless. A few Honor Guardsmen unwilling to ally with most of the remnant groups of the former Covenant pledged allegiance to the Banished, specifically Shipmaster Let 'Volir who served Atriox in an unconventional arrangement, seeing opportunity in the service of the powerful mercenary organization. Evoking the traditions and accomplishments of their predecessors and using re-purposed ceremonial equipment of the old Covenant Honor Guard, these Honor Guardsmen are skilled swordsmen who match the Covenant's Honor Guard in fighting prowess. A Sangheili Honor Guardsman in Halo 2. A Honor Guard in Halo 2. A procession of Sangheili Honor Guardsmen. Sangheili Honor Guardsmen during the judgment of Thel 'Vadamee. Honor Guardsmen in non-ceremonial armor protecting the High Prophet of Regret in Halo Wars. A render of a Sangheili Honor Guardsman in Halo Wars. Concept art of the the Sangheili Honor Guards in The Babysitter. Honor Guardsmen aboard the Fleet of Righteous Vigilance's flagship in The Return. A model of a Sangheili Honor Guardsman in Halo 2: Anniversary. An Honor Guardsman aboard High Charity. John-117 engaging a Sangheili Honor Guardsman. An Honor Guard on High Charity. An Honor Guard with an energy sword. An Honor Guard with a carbine. Honor Guardsmen stand guard in the High Council Chamber before the Prophets. Honor Guardsmen line the entrance to the Sanctum of the Hierarchs. A pair of Honor Guardsmen at Regret's side aboard the Solemn Penance. Concept art of a Banished Honor Guard for Halo Wars 2. Blitz card of a Banished Honor Guardsmen in Halo Wars 2. A Banished Honor Guard kills two Sangheili Rangers.